In college, Mike Watts studied economics and found himself on a path that led him to a job in the commercial banking industry following graduation. But he quickly realized that didn’t hit the right spirit. “I realized that I wanted a position that would allow me to build relationships and help people on a daily basis. Growing up, both of my parents were educators and I always admired how they had the ability to make a difference in peoples’ lives within our community,” he recalls. Then one day as he began pursuing a job opportunity on behalf of a friend, he got an offer himself. “As I was calling a friend of mine about this job opening — originally on behalf of another friend — he said, ‘Everyone I’ve been talking to said I should be hiring you,” says Watts. Suddenly, Watts was in insurance and building relationships and helping people navigate the health insurance marketplace. In April of this year, Watts left a position with a carrier that he held since he started in the industry for a new job with Janesville, Wisconsin-based SASid, short for “Simple and Smart Insurance Development”, as the new VP of Sales heading up the company’s Indiana operations. “We build insurance platforms in the supplemental health markets with options from a variety of carriers. These platforms allow agents to sell policies that range from short-term medical, fixed indemnity, dental, vision and other ancillary products under a single billing source,” he says. Originally founded in 1998 by two brothers, Watts learned about them and SASid through his prior work at HCC. “I always admired what they built and what they stand for. Their mindset is always to innovate the market and to build products that add value to every situation. Their model has always intrigued me,” he says. Watts is currently working with six individuals at their Indianapolis office, but they intend to double that number by the end of this year or early next. He’s looking at ways to get SASid more involved with NAHU to help in that growth. Capitol Conference has been a spirited place for the past several years as insurance legislation passed between chambers and the White House all while NAHU and other interests try to make sense of what’s happening. Since the Affordable Care Act, NAHU’s stance — and the stance of many individual agents — has been that the ACA is more harm than good. This puts Health Underwriters against ardent supporters around the political lightning rod that is the ACA. “This idea that NAHU leans conservative only comes from the ACA because it’s so political,” says Watts. 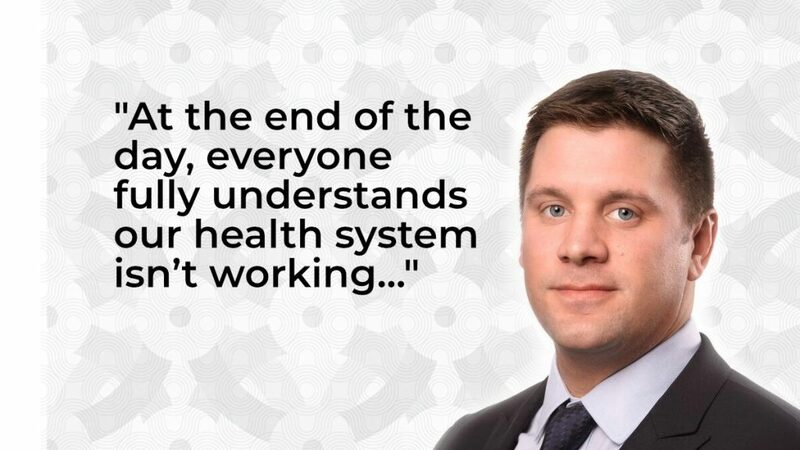 “At the end of the day, everyone fully understands our health system isn’t working. Rate increases are as bad or worse as they were before the Affordable Care Act was passed. In many instances, customers are frustrated with their premium payments and the lack of options in their area. When we talk about everyone having access to insurance, everyone jumps on board. But how do you fund that?” Watts admits he doesn’t know the answer to that question but points to an unlikely source for inspiration: Canada. Given the change, however fast or glacial it may seem at any time, Watts says he’s glad NAHU is there to give everyone a voice. “I don’t know if one system will work for everyone, but like any industry, we can make it better. We can think of new things and innovate. NAHU serves a strong purpose there with a multitude of messages,” says Watts.